The global optical brighteners market is led by players such as BAFF SE, Akzo Nobel N.V., and Huntsman Corporation. These three players constitute a collective share of 46.4% in the market. These companies are focusing on product development and innovation in order to maintain a strong foothold in the market. In addition, a number of mergers and acquisitions have been taking place in the market with specialty manufacturers in emerging economies which also come under the prime strategies adopted by the key players, as per Transparency Market Research (TMR). 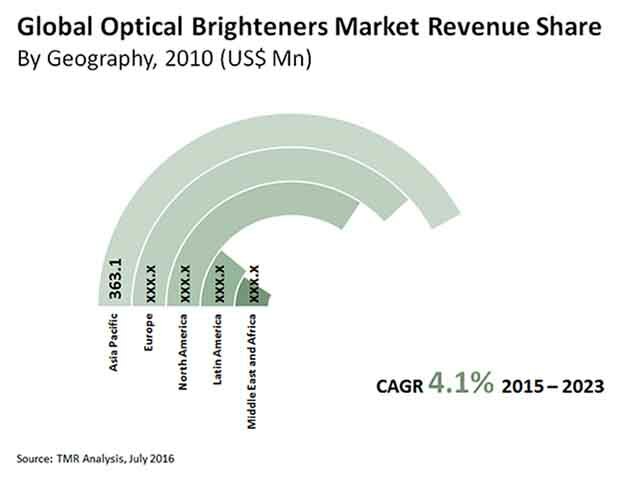 The global optical brighteners market is predicted to reach US$1,711.3 mn by 2023, on the basis of revenue. On the basis of chemical type, the segment of stilbene led the market in the past on the basis of both volume and revenue and is predicted to maintain its superiority all through the forecast period. This segment is predicted to expand at CAGR of 4.40% over the forecast period. This segment will lead the market due to the presence of numerous isomers and derivatives of stilbene utilized as optical brighteners. This segment is trailed by the segments of coumarin and diphenyl pyrazoline which held shares of 11.0% and 9.0% in the market in 2014. On the basis of application, the segment of detergents led the market in the past on the basis of both volume and revenue and is predicted to hold this leading position all through the forecast period. This is due to the growing employment of optical brighteners in detergents for enhancing the fluorescence of washed clothes. The segment of textiles is predicted to trail the segment of detergents and hold the second position in the global optical brighteners market. The segment of textiles is predicted to rise at a CAGR of 3.60% during the forecast period. On the basis of geography, both North America and Europe came up as the key revenue generators in the market in the past and are poised to maintain their lead role through 2023. However, they may experience a minor decline in their shares, nonetheless, the increasing count of growth opportunities in the textile and detergent industries will make the North America and Europe markets rise at a CAGR of 8.10% and 7.30%, respectively, all through the forecast period. The growing cosmetic industry is poised to have a positive impact on the growth of the global optical brighteners market. “In addition, the growing disposable incomes and the growing demand for suncare and skincare products have also fuelled the development of the market for cosmetics,” says a TMR analyst. In addition, the soaring textile industry will boost the optical brighteners market owing to the fact that textiles are a key application area for optical brighteners. The introduction of newer fabrics and materials which have enhanced properties and brightness have also worked in favor of the growth of this market. On the other hand, numerous strict government norms posed globally are negatively impacting the growth of the optical brighteners market, states a TMR analyst. In addition, the downfall of the global paper industry will go against the development of this market. Nevertheless, the increasing employment of recycled fiber is a key growth opportunity seen in the global optical brighteners market.